Who was William P. Duval? DUVAL, WILLIAM POPE (1784-1854). William P. Duval’s career started as a lawyer and included some years as a statesman. He was the son of William and Anne (Pope) Duval, born at Mount Comfort, Virginia. His ancestors were French Huguenots, Protestants who had to leave their native land, not unlike the Puritans leaving England. Several of his forebears were attorneys and judges. His early years were spent in Kentucky, which was the frontier at the time. In 1804, he was admitted to the bar and married Nancy Hynes who was the mother of their eight children. In 1812 he served as a captain of mounted rangers in local Indian wars. From 1813 to 1815, Duval was a Kentucky representative in the House of Representatives of the Thirteenth Congress, after which he returned to practice law in Bardstown, Kentucky. William P. Duval’s involvement with the future state of Florida began when President Monroe appointed Duval a federal judge in the Eastern District of the Florida Territory on May 18, 1821. A year later, beginning in 1822 to 1834, Duval served for 12 years as the civil governor there, succeeding a territorial governor put in place by the military. While governor, Duval accomplished many ground breaking achievements, including a peaceful settlement of Seminole Indians to the South of Florida, a codification and revision of the code of laws in use, setting the capitol at Tallahassee, and creating a board of education to enhance the growth of schools. From 1839 to 1842, he was a senator in the Florida legislature. In 1845, he served as a commissioner to settle the disputed northern boundary of Florida. 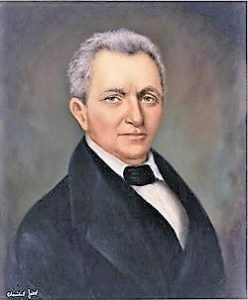 When two of his sons participated in the Texas Revolution, William P. Duval followed them to Texas in 1848 and settled at Galveston to practice law. Sam Houston was among his clients. Duval died in Washington, D.C., on March 19, 1854, while there on legal business. He is buried in the Congressional Cemetery. His life inspired two famous writers to base characters in their works upon Duval: Washington Irving’s character “Ralph Ringwood” and James K. Paulding’s character “Nimrod Wildfire.” In addition to our DAR chapter’s name, his name also is the inspiration for Duval County, of which Jacksonville is the county seat, and was carried upon one of the World War II liberty ships. For more information on the DAR, go to What is DAR? For more information on the William P. Duval Chapter, contact Regent Bettie Jenkins. The content contained herein does not necessarily represent the position of the NSDAR. Hyperlinks to other sites are not the responsibility of the NSDAR, the state organizations, or individual DAR chapters. For corrections, please contact webmaster Elaine Powell .